John Doss first service as pastor of FBC came on August 10, 2014. He was saved at the age of 13 at a youth rally in Topeka, Kansas. His call to preach came two years later at a Pastor's conference in Hammond, Indiana after hearing Dr. Jack Hyles preach a message entitled "God's Game Plan". After graduating from a Christian high school, he went on to earn a Pastoral of Theology degree at Hyles-Anderson College in Crown Point, Indiana and there met Laura Tottleben. They married on August 7, 1993 in Jerseyville, Illinois. Over the past 25 years John has served in ministries in Illinois, Ohio and West Virginia. 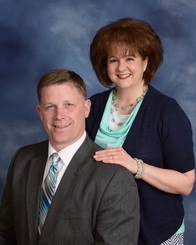 John and Laura enjoy working together in the ministry of Faith Baptist Church and are thankful for the privilege God has given them to be co-laborores with the great people of this ministry and community of Richmond, Kentucky. Brock Henry has been on staff since August 2015. Born in Meadville, Pennsylvania on September 28, 1991 Bro. Henry was raised in a good, Christian home. At the age of 9, he was saved at Open Door Baptist Church and called to preach at the age of 13. After graduating High School in 2010, Bro. Henry came to Lexington, Ky to go to Commonwealth Baptist College where he graduated in 2015 with a Master's in Pastoral Theology. He and his wife, Jordan, were married on June 18, 2016. Bro. Henry drives our church bus and takes care of the graphic design at Faith. He is also our Music Director as well as Youth Pastor. His passion to serve the Lord and our church is evident each and every day. Steven Hutchinson has been on staff since July of 2017. Bro. Hutchinson is from Berryville, Virginia and was saved at the tender age of 6. He recalls sitting on his mother's lap in the lazy boy chair as his mother showed him God's plan of salvation. After high school, Steven moved to Lexington where he earned his Bachelor's Degree from Commonwealth Baptist College as well as met his wife, Danielle. Steven and Danielle were married on June 10th, 2017. Bro. Hutchinson is our School Principal as well as Children's Pastor and is well suited for both. He is excellent with our children and they love him. He preaches in Children's church as well as Kids Time on Thursday Night during our soulwinning time. He also helps with our special music and bus ministry. He is a great asset and blessing to Faith Baptist Church. Mrs. Hutchinson has been our church secretary since July, 2017. ​Danielle grew up in Newnan, Georgia. After graduating from Newnan Christian School, she came to Commonwealth Baptist College to study to be a Christian school teacher. It was here where Danielle made full assurance of her salvation and graduated in May of 2017 with her Master's Degree in Secondary Education. She is the wife of our Children's Pastor, Steven Hutchinson and aids him in the children's ministry. She is a talented singer and sings regularly in church as well as helping in the bus ministry. God has blessed us to have her in our ministry.